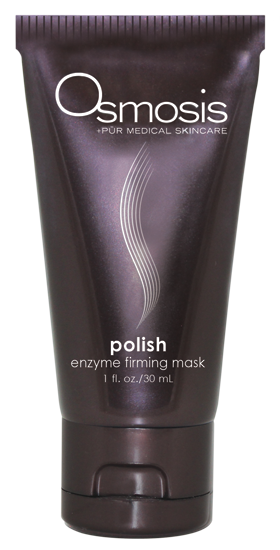 Polish is our delicious cranberry enzyme-smoothing, peptide-firming, antioxidant mask. This mask provides a gentle firming effect and a radiant glow that lasts for many hours which leaves your skin firm, smooth and beautiful. Polish is our delicious cranberry enzyme-smoothing, peptide-firming, antioxidant mask. It is a mild, exfoliating mask that gives the skin a smooth, healthy appearance with each application through the use of cranberry enzymes with small amounts of L-lactic Acid. It contains 1% of the potent antioxidant CoQ10 that leaves your skin protected and radiant. Using fruit and other gentle enzymes, Polish is designed to remove only the exfoliating epidermal layers by primarily cleaving protein (keratin) and minimizing lipid removal. In addition, Polish provides a gentle firming effect and a radiant glow that lasts for many hours which leaves your skin firm, smooth and beautiful. Exfoliates, firms and restores skin health. Apply a thin layer to a clean face 1-3 times per week. Leave on 5-15 minutes then rinse.